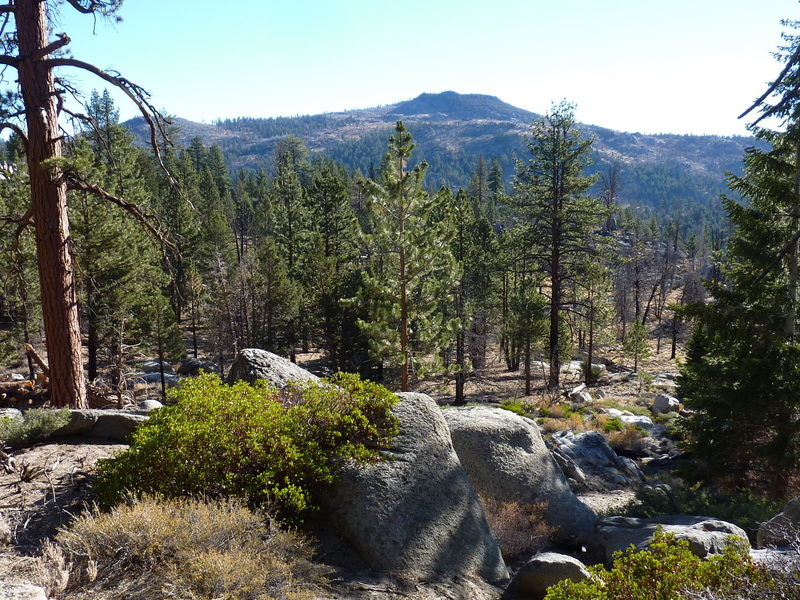 Deer Mtn is a P1K in the Southern Sierra, located in the heart of the South Sierra Wilderness. I was in the area for four days to tackle this and a handful of other P1Ks I had neglected on previous visits. My starting point for Deer and a few bonus peaks was the end of the eastern fork of the Monache Jeep Road that itself forks off the Blackrock road. The pavement ends about 3/4mi from the trailhead and when I started in the morning I was at first hesitant to drive down the rutted road. But after hiking about 100yds I determined that the road got better instead of worse, went back to get the car and drove it to its end. It was colder this morning than the previous one by some 10 degrees, starting out at 31F when I left the van for the second time. Still, it wasn't that cold (I've started October hikes in the Sierra at 20F) and would warm up pleasantly enough once the sun came up. I didn't start as early as I had the previous day since the hike wasn't going to be as demanding and there was little concern for running out of daylight even as the days were getting shorter. The sun had just risen when I started out at 7:30a, shining brightly on Jackass Peak to my left when I passed by it in the first mile. I had climbed Jackass along with nearby Granite Knob while climbing the SPS-listed Smith Mtn back in 2006, though I don't remember much of the details (which is the primary reason I write this stuff down). The Albanita Trail I traveled starts as an old logging road closed to vehicle traffic, then becomes a single track trail after about a quarter mile. The Wilderness boundary is passed in that first mile at a saddle where the trail starts a gentle decline (the saddle is on the divide between the North and South Forks of the Kern River - interestingly, the divide itself runs north-south). I was amused by what must have been an OHVer's dissatisfaction when he scratched "Thanks Cranston" on the Wilderness sign. Cranston was a US Senator from CA, one of the backers of the congressional legislation that led to the creation of the South Sierra Wilderness in 1984. He was treated with much the same disdain as Boxer and Feinstein are today by the same crowd. Gotta love politics. I followed the trail southeast to Albanita Meadow, brown this time of year as all the meadows are in the area, but easy enough to walk across without soaking one's boots. The Aqua Bonita Spring at the side of the meadow was also dry, surrounded by a wooden stockage to keep the cattle from crapping in it. I had some trouble locating the trail past this point, later finding it was along the northern edge of the meadow on my return. Instead, I used a cow trail that ran down the center of the meadow, eventually reaching a trail junction at its SE end. Here my route turned north onto the Lost Meadow Trail, passing over a low saddle in the forest before reemerging into Lost Meadow. This narrow, mile-long meadow has a lovely view of Olancha Peak to the north. Near the northern end of the meadow I failed to find the trail turning east through the meadow's drainage as expected. I could see Deer Mtn at this point over the trees in that direction, so I headed off in search of the trail I expected to find taking me down to Beck Meadows at the foot of Deer Mtn. I did manage to find the trail, but it's hard to locate. Diamond-shaped metal markers periodically tacked to the trees were helpful in keeping me on track. The trail seems to have suffered some damage due to blowdown and rockfall and has seen little maintenance over the last decade, becoming more of a use trail. Down in Beck Meadows I found the Lost Meadow Trail sign indicating the start of the trail, but good luck finding it if you haven't already come down it. Beck Meadows is quite large compared to the other meadows I had passed through. Together with Monache Meadows to which it's connected, the pair form a huge meadow complex almost 8mi in length through which the South Fork of the Kern River flows. At the northern end rises Olancha Peak while to the south can be seen Crag Peak on the left and Finger Rock on the right. Near the Lost Meadow Trail sign is a rock dam held together by wire mesh. A sign attached to it indicates it was erected in 1980 by the Self Help Program, a mostly non-descriptive term that offers little insight into the builders and purpose. Self help for those building it? For those it is intended to help? Cattle? Deer? An online search later didn't help me any, and the dam (which held no water) remains a mystery. I continued east across the meadow, crossing the PCT on my way to the base of Deer Mtn in front of me, its summit out of view behind a lower false summit seen from this vantage. A fire had burned over this western slope of Deer Mtn in 2004, leaving the ghostly-white remains of the trees that once cloaked the hillside. While leaving a somewhat stark landscape, it also made the cross-country travel rather easy, taking only an hour to climb some 1,400ft to the summit. I found two registers at the rocky outcrop forming the westernmost and highest of two summits. The first had been placed by a Carl Heller party from the China Lake Mtn Rescue Group in 1971. A second one was placed in 1986 by an SPS group to commemorate the 30th anniversary of the Sierra Club section as well as the 1956 ascent of Deer Mtn led by Frank Sanborn. Together the two registers totaled almost 50 pages of entries over 43 years. Matthew Holliman had told me he'd climbed Deer back in February so I wasn't surprised to see his as the most recent entry in the second register. I found that my GPS had died due to weak batteries and had neglected to bring a spare set. Having died somewhere back near Lost Meadow, I turned it back on for a brief moment to let it acquire a trackpoint at the summit before turning it back off again before it shut down on its own. I would repeat the process at Finger Rock to at least verify a few key points, but for navigational purposes I was on my own with the old dead reckoning method as I hadn't even a paper map with me. Through the trees to the east is the second summit a few hundred yards distance, and in the interest of being thorough, I decided to visit it in case it turned out to be the higher point. The 2004 fire had stopped just short of the summit and it was a brushier affair to reach it, not really worth the extra effort. I found nothing of interest there and it appears to be slightly lower to boot. I took a longer break here to eat lunch before starting back down. I retraced my route back to Beck Meadow and then up to Lost Meadow. I did a much better job of following the trail through the steep section this time, losing it only briefly for a short stretch. The trail is there, just not used very much and not the most obvious. On the way back I had three bonus peaks in mind, Finger Rock and two unnamed summits, none more than about 8/10mi from the trail. Without the GPS functioning, I wasn't sure about being able to navigate to them. Really, the concern wasn't so much as getting to the highpoints (which isn't so hard) as getting back through the forest to the correct trail in this maze of meadows that all look similar. Finger Rock was the most interesting of the three and the one that I'd regret not visiting the most. I had noticed it first eight years earlier when visiting Crag Peak to the east. We had gotten a late start that day and the hope of tagging Finger as a bonus peak was lost with the lateness of our summiting. I had seen it just yesterday while hiking around Monache Meadows and from a distance the finger-like summit looked like it might be difficult. I might not be able to climb it without a rope and had no foreknowledge from sources online or in print (Jenkins shows the summit on her map but neglects any mention of climbing it). I thought I should at least go up to check it out and see what it would take to climb it on a future trip. It was after 1p when I left the Lost Meadow Trail at the low saddle south of Lost Meadow, angling southeast towards the middle point of the summit ridge where I expected the highpoint to be. The map has the Finger Rock label at the north end of the ridge but that appears to be misplaced, judging from the views I had seen of it the past few days. My navigation skills without the GPS turned out to still be quite good as I found my way up increasingly more difficult rock on the west side to reach a notch just north of the summit pinnacle. I appeared to reach a first impasse here with the rock directly on the ridge too difficult to solo. I worked around to the east side to see if I might find a way there, but while better than the direct approach, it looked like an exposed 15-foot section of class 5ish rock that I didn't have the nerve to attempt. Back to the notch, I worked my way around the west side, dropping about 10ft before finding class 3 scrambling to a second notch directly below the north side of the pinnacle. I was far from out of the woods on this one though. The summit block, rising about 20ft above me from this point was most imposing. I looked around the other sides to assure myself that the north side provided the only reasonable way to the top. Upon closer inspection, I could see that someone had stacked up some rocks against the north side to assist an awkward mantle onto the sloping ledge leading to the summit, terribly exposed should one slip. I looked at the rickety arrangement of rocks - this one was going to take some more thought. A few days earlier I had managed to injure my left shoulder in some unknown manner that I could only chock up to increasing age. Only with some effort and pain could I lift my left arm up above my head. While I couldn't lift a heavy object with a bent arm, I could still lift straight up with a locked elbow. My arm and shoulder weren't completely useless, but only about halfway so. I had figured out how to adjust my moves over class 3 terrain to reach the point I had gotten to, but this summit mantling move was going to be beyond the strain my left shoulder could take at the moment. It didn't help that the badly sloped block above was lichen-y or that my reduced flexibility with age was going to prevent me from lifting my crucial right foot high enough. I decided to spend some time rearranging the rocks into a more secure platform. I used thin rocks for shims to take the wobble out of the larger rocks and carefully arranged them for more secure footing. My first effort resulted in a nice platform that I could step on without trepidation. Though secure underfoot, I couldn't mantle with the injured left shoulder and likewise couldn't raise my right foot high enough to secure a footing to relieve my shoulder of the mantling effort. My second effort at arranging the rocks took longer and made the step about 6-8" higher than the first effort, but the footprint of the top rock was smaller and felt far less secure. I gingerly stepped with my left foot up on the new arrangement to see if it helped enough. It did, but just barely. With crimpy little finger holds and my right foot just able to reach the sloping ledge, I pushed myself up onto the rock and hustled out of the awkward and insecure position to the relatively safety of the highpoint above. While disappointed at finding no register, I was happy to look both north and south across the summit ridge to ensure I was indeed at the highest point. It was a fantastic vantage point from which to view the Southern Sierra on an exceptionally clear day, but I was too nervous about descending the awkward step to relax at the summit. I felt I had to get back down while the memory of the moves I made were still fresh in my mind to allow me to reverse them. Thankfully this went off without a hitch, lowering my left leg over the edge of the sloping block, sight unseen, to where I expected it to contact the 8" rock. It did, and just as quickly I was back on safer terrain. As I descended back down the west side of Finger Rock I was elated with my success. After Stegosaurus Fin, it was the most exciting scrambing I'd found in the Southern Sierra. Happy with the results, I decided to give another of the bonus peaks a try. With only minor detours in finding the trail, I got myself back onto the Lost Meadow Trail and followed it as it turned west into Albanita Meadow. Near the northeast end of the meadow I turned north, aiming for Peak 9,156ft less than half a mile from the trail. Several hundred feet in height, I had noted it earlier on the way to Deer Mtn, a large rock outcrop that appears to be the lower companion to Jackass Peak further west. Peak 9,156ft has a smaller brother itself, forming a second, miniature dome of rock just to the SE. I bypassed this lower point in making my way to the saddle between the two, finding the easiest rock to the higher summit on the right side of the SE Ridge (mostly just class 2). It was 3p when I reached the top. I half expected to find a small Smatko register here, but found nothing. There is a good view of Albanita Meadow and Smith Mtn to the southwest, as well as the third bonus, Peak 9,187ft (middle of photo). The latter seemed pretty bland compared to the other two with forest covering it completely. I decided it didn't merit the extra hour it would take to add it to the day's itinerary. I descended a more interesting route off the summit, directly down the class 3 SW face, both more fun and a quicker route back to the trail. Bob replies: I do mention them when I run into them, but it's fairly infrequent. Mostly they run away before I can get the camera out. Only once I had bear growl at me and it was with a cub rummaging through the garbage cans at Twin Lakes CG. The two most memorable bear encounters were ones I didn't even see. See the 1999 report for Matthes Crest and the 2005 report for Cathedral Rocks.